Our range of products include note sorting machine. Maxsell Note sorting machine Maxsell Matrix-V is Professionally Built & based on Advanced Counterfeit Detection and CIS-based technology. 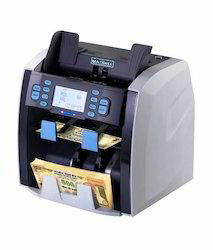 Maxsell Matrix Currency Sorting Machine is the outcome of our experience to have developed most successful Note counting machines & detectors like MX50i, MX50i Turbo & Truscan Neo for Indian rupees. For Instance, the Display is very simple yet fully informative, thus the user easily adapts Matrix Sorter in no time. To ensure faster up-gradation we have to introduce software up-gradation from SD card, where a user need not wait for engineer or expert advice.